These glitter art pieces took us around the world and back. Over 200 pounds of glitter was used to cover these art pieces. By now, most of you are familiar with the unique, high quality creations that come out of our design and fabrication studio. What you probably aren't aware of is just how much work goes into them after they are actually made. Sure, "we create what doesn't exist", but it also goes well beyond that. Depending on the project, our creations still may need to be transported, customized, installed, operated, programmed -- all requiring the same high level of expertise. When international luxury lifestyle brand Saint Laurent asked us to design and fabricate several large art pieces to be installed in retail stores across the world, creating them was only part of the challenge. In the designing process, we also had to take into consideration how these substantial pieces would be safely shipped and installed at locations on different continents, without making compromises to their aesthetic appeal. For the 7-foot glittered spheres, we built them in quarters, and used CAD to develop an efficient crating approach. Shipping was coordinated with an SCPS install team that travelled to each of the six cities, from Milan to Hong Kong, all within a two week window. Once at the location, the team uncrated, assembled, and installed the pieces during the store's non-operating hours. 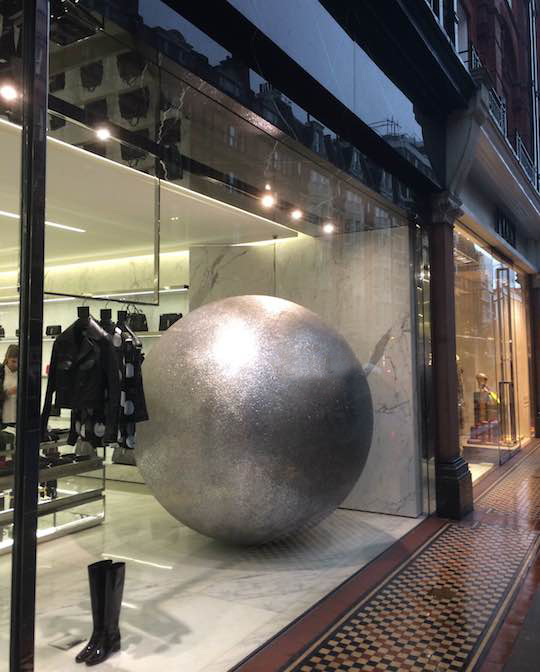 The mounting apparatus for the large spheres had to be attached to the store's marble floor without damaging the surface. And touch-up work was then done so that all of the seams between the components of the pieces would be invisible.